With recent hurricanes narrowly missing the Rio Grande Valley, several local, state and even federal lawmakers who attended the groundbreaking Friday of a new, massive $400 million drainage project north of Edinburg near Faysville, were wise in warning that our region has been lucky to date. But they predict a big storm will hit us and flood waters will overwhelm us if we don’t get drainage issues under control. 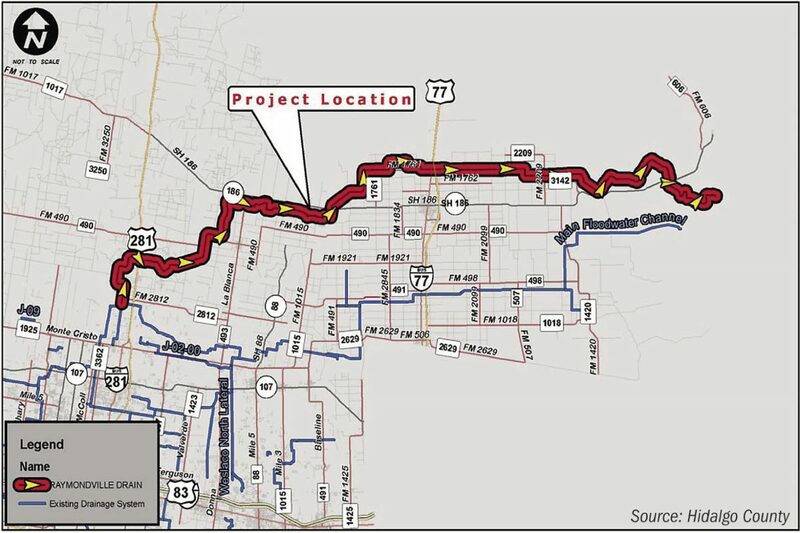 The project they were celebrating — called the Raymondville Drain — is expected to do just that for our entire Valley region, and has been the dream of a generation before us who saw the need, but didn’t have the money. We cannot overstate the significance of this project and we commend policymakers who are making it happen. And don’t let the name confuse you as to the importance of this project for the Upper Valley and Hidalgo County. It’s called the Raymondville Drain because Raymondville, in Willacy County, is the lowest-lying area prone to flooding in our region and first drew attention to the need to fix drainage in South Texas. But this project will actually begin in Hidalgo County, in north Edinburg, and once completed will literally change the RGV landscape forever and will have a huge impact on our entire region. Once finished, it will include a 350-foot-wide, 12-foot-deep ditch along a 63 mile pipeline corridor that will create a new channel for carrying and storing rain runoff and what they call “urbanized water” in the Upper Valley. This should alleviate pressure on the main floodway channel, called the North Main Drain, which carries storm waters east to Willacy County to the Laguna Madre and Gulf of Mexico. Also created will be numerous retention ponds stretching from the Upper Valley to the Gulf. 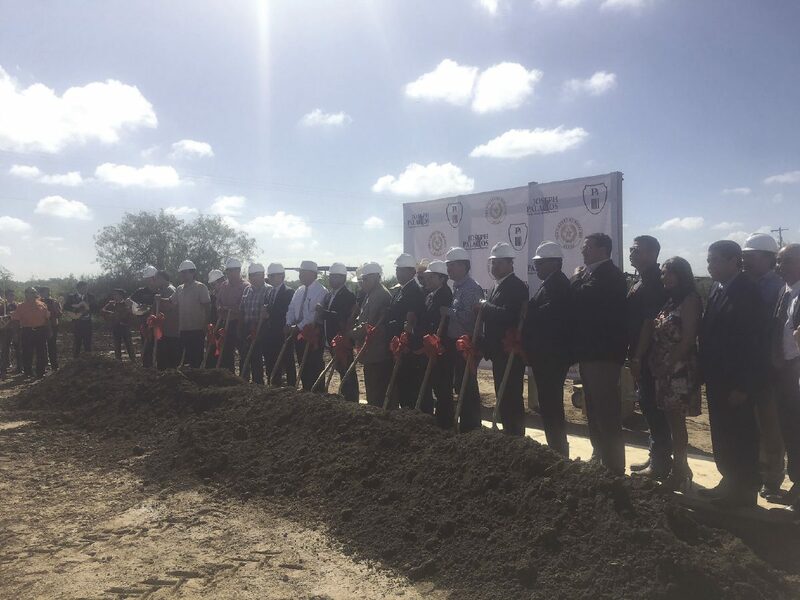 Several local, state and federal lawmakers gather in north Edinburg on Oct. 6, 2017, for the groundbreaking of Phase I of the $400M Raymondville Drain. Even better news is that Palacios announced that 75 percent of the total cost will be reimbursed by the federal government. To date, over $17 million has already been sunk into this project, which is 30 years in the making, and none of it was local funds, thanks to a collaboration among state and local and federal entities, Palacios said. Thank you and your board for investing here, sir. With so much population growth and an increase and change in businesses from what once was predominantly an agriculture community, we have long recognized the need to change our drainage landscape to prevent major flooding and/or loss of life here. We know that storms in the past few years that have overwhelmed the Edinburg area have been a harbinger of what Mother Nature could unleash to our entire region, if we do not address this problem quickly. Hidalgo County Floodplain Manager Raul Sesin explained the Raymondville Drain will allow for a diversion of waters from areas to the west, like Mission and Palmview, as well as McAllen, Edinburg and alleviate areas in the east like Weslaco and La Villa. Waters will be diverted to La Sal Vieja Lake to desalinate that lake, which will help local wildlife there. “It’s the most important watershed project for our region,” state Sen. Eddie Lucio Jr., exalted. Recapturing the water and holding it for future use, undoubtedly will help during droughts. And having the ability for water to flow strong through the channel in times of flood, hopefully will prevent flooding in our homes and businesses. Furthermore, being able to circulate water to poorer communities, like colonias, and alleviating flooding in those areas has long been a huge problem we have needed to address. We wholeheartedly agree and urge all involved parties to keep tight oversight on this project to ensure it goes quickly and as planned, so that we may continue having access to these federal and state funds. And so that our area may capture, preserve and reuse this most precious natural resource.